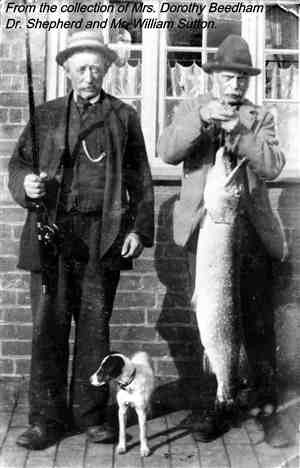 Dr. Shepherd and Mr. William Sutton, with prize pike caught in the canal. Many different groups in Bottesford organised social events. Details taken from the Angling Association Minutes-June 24th 1936 to 1953 show that the Bottesford and District Angling Association established quite a lively tradition in the pre 2nd World War years. Thanks are due to Mr. Brian Cross who kindly loaned the Minute books. In the minutes, it is recorded that the Association organised dances in 1937, 1938 and 1939 before war broke out in September 1939. The committee at that time worked hard to provide entertainment for all ages at these occasions. All the planning took place in November and the events occurred in the following January. In November 1936 the planning for the annual dance in the following January is recorded. Tickets would be 1/6d with no reduction for children. It was thought that 20 tables of whist could be accommodated in the infant classroom (80 persons) and people attending the whist drive and dance would number another 80 persons. It was also stated that a fancy dress competition would attract adult and child entrants in the various classes but because of financial hardships, it was agreed that children would be half-price. The Duke and Duchess of Rutland are recorded as being unable to attend, so Lady Ursula Manners would judge the fancy dress and award the prizes. According to the accounts, the band cost £2/15/0d, the rent of the school was £2/3/6d and floor polish was 1/6d. Mr. Robinson, the school care-taker organised the refreshments and table skittles was also played. In 1938 the dance was to be in aid of the District Nursing Scheme and also the Medical and General Aid Fund. It was noted that the Accordion Bandits were in demand and that they needed booking as soon as possible. The cost of the 5 band players was £3/17/6d and the school piano also needed tuning. There was to be the dance (there was concern that a new partition in the larger school would curtail the dancing), a whist drive, skittles and the fancy dress competitions. These would be judged by the Duke and Duchess of Rutland, assisted by Lady Ursula Manners and Mrs. Hamilton, the wife of Doctor Hamilton. They would be presented with sprays of flowers. The doctor was to be asked to say a few words in support of the District Nurse Scheme particularly as an epidemic was occurring at the time (no details of the epidemic are given). Mr. and Mrs. Robinson would cater and Mr. W. Sutton and Miss Lunn were to be in charge of the cloakrooms. Rooms would be decorated and balloons, cigarettes, chocolates and paper hats would be bought. In 1939 the school managers were reluctant about the fancy dress taking place because of the damage caused to furniture. However, the committee considered that not to have it would ‘adversely affect receipts’. So the fancy dress would take place and an undertaking would be given that ‘no person would be allowed to stand on the f’ture’. The event was to be in aid of the Medical and General Aid Fund and the Duke of Rutland would be asked to attend, with the Duchess. The event would start at 7.00p.m. until 11.00pm, there would be whist, dancing, the fancy dress and darts instead of table skittles. Mr. Holloway offered to loan the board and arrows from the Social Club and there would be 2 prizes for the top darts score, as well as prizes for the other events. It was decided to engage the Imperial Dance Band as they would only cost £2/16/- for the 5 players. From the accounts, Jack Branston was paid 2/6d for care-taking and moving furniture and a total of £24/7/0d was made minus £5/16/3d for expenses. The war intervened and there is no recored of any social events until the minutes in 1949 when it is recorded that a whist drive and dance in October or November was needed to ‘augment’ the Medical Aid Fund. The whist drive and the dance would cost 2/- each and an inclusive ticket would be 2/6d. ‘Monti was to cater‘, the M.C. would be Mr.Sprawson and the floor powder was priced at 1/9d. In 1950 it was proposed that an event take place near to Christmas but at a meeting in February 1951 the idea was left in ‘abeyance’. We have no photographs of these events. If anyone further recollections or photographs please do leave a comment. This page was added on 01/10/2007.